California voters have overwhelmingly approved Proposition 56 which raises the State’s excise tax on cigarettes to $2.87 per pack and applies an equivalent duty on electronic cigarettes. The ballot initiative was approved by a convincing majority of 64.4% of votes cast. Spending to defeat the measure was approximately twice the amount spent in favor. Revenue from the additional two dollars in tax will be earmarked for physician training, tobacco use prevention, cancer research and other health related programs. Many in the vaping community fear that the tax on e-cigarettes will raise prices of the devices and liquid nicotine by 60% and discourage smokers from switching to a lower risk alternative. A similar proposal known as Initiated Statutory Measure 4 was strongly rejected by 61.7 of North Dakota voters who showed up at the polls on Tuesday. The purpose of the Measure was to fund a veterans trust fund and a community health trust fund with revenues from a higher tax on cigarettes and tobacco products. The current 44 cents per pack tax on cigarettes would have risen to $2.20 under the proposal while the tax on all other tobacco products was set to increase from 28 percent to 56 percent of the wholesale purchase price. Measure 4 would have expanded the definition of “tobacco products” to include liquid nicotine and electronic inhalation devices. Taxing e-cigarettes the same as tobacco is considered poor policy in many circles, including numerous public health authorities. The UK Royal College of Physicians has written that “the hazard to health arising from long-term vapour inhalation is unlikely to exceed 5% of the harm from tobacco smoke”. The rational approach to taxation of nicotine products in the view of the RCP would be to apply tax in proportion to their hazard, in which case the tax on e-cigarettes should be held stable or even reduced. 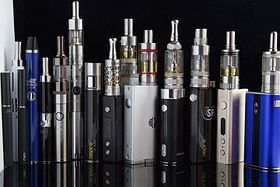 Other more strident activists in the tobacco control community hold that the relative safety of vapor products remains unproven and that caution urges that e-cigarettes be taxed at similar levels to tobacco products. Pennsylvania offers an example of the downside of this approach. On October 2016, the keystone state classified electronic cigarettes as tobacco products and levied a 40% tax on the wholesale price. As a result, dozens of vape shops across the state shut down and ceased operations citing the untenable impact of the tax.